At a recent Nuclear Regulatory Commission webinar/hearing on "Waste Confidence," or what to do about the growing mountain of radioactive used reactor cores, people on both sides actually agreed on SOMETHING. I didn't like the term "Waste Confidence" and the pro-nuker didn't like it either. Other than that, there was little to agree on. The pro-nuker preferred to call it "spent fuel confidence." I, on the other hand, didn't like the word "confidence" since there's nothing that warrants ANY confidence in this discussion, whatsoever. "Waste Failure" would be more appropriate. Or "Waste Impasse" might be even better. Or better yet: "The Intractable, Unsolvable, Filthy, Disgusting Mess We've Made" but I guess that would just be too accurate to a group where a "rapid disassembly" is the term for a core explosion that spews radioactive crud for miles around. But one way or another, it's obvious that "Waste Confidence" is a misnomer from start to finish. The NRC officials stressed that in their 30 years, they have not overseen a major accident at a nuclear facility, during transport, or at a waste storage facility such as a spent fuel pool or dry cask storage farm. Of course, TEPCO and the Japanese nuclear regulators made the same claim of confidence and historic precedent. Then Fukushima happened. The NRC's confidence is wholly out of proportion to their "success" thus far: There HAVE been accidents, there HAVE been releases, and most importantly, there have been CLOSE CALLS where only good luck (aka the Grace of God) saved us. A fire nearly took out Browns Ferry, and TMI did NOT become a Fukushima or Chernobyl, but could have. And Davis-Besse in 2002 was fractions of fractions of an inch from a catastrophic hole in the reactor pressure vessel head. San Onofre's Unit 2 pressure vessel head (and many others around the nation) was replaced during the last outage as a direct result of increased inspections following the Davis-Besse incident. SanO's Unit 3 was due for a head replacement when it blew a tube in one of its new steam generators. Japan had been lucky many times before, as small accidents did not become global catastrophes: Monju, 1995, Tokai, 1997 & 1999, Mihama, 2004, and Kashiwazaki-Kariwa, 2007 to name a few. But as every smart gambler knows (that's everyone who doesn't gamble with their lives), luck runs out sooner or later. On March 11th, 2011, luck ran out for Japan. Nuclear waste storage is a huge unsolved problem in every nuclear country. Although France, Japan and several other countries reprocess spent fuel, they have had numerous incidents at their facilities and numerous releases of radiological materials into the environment. In addition to being dirty, reprocessing is energy-intensive and expensive. For these and other reasons, such as proliferation issues, we do not reprocess spent fuel in America, and don't expect to. Instead, we just hold onto it. What else can we do? There's nowhere to put it because all the options we've explored as a country haven't worked out: Dumping the waste at sea was banned decades ago, rocketing it into outer space is not only prohibitively expensive, but even the most modern rockets have an alarming failure rate -- and that is unlikely to improve, not just because the debris field in near earth orbit is getting more and more crowded, but because fraudulent electronics parts have been turning up everywhere -- including in military and aerospace applications. We looked into placing the waste deep in the earth, but the earth is too unpredictable. Yucca Mountain is often called a political failure, but actually: There are earthquakes there! And not to mention water seepage from above, a vast and precious water table underneath, and insect/vermin infestation issues too. And it was on sacred Indian land. Is there one square foot of land on this earth which is NOT sacred to us all? We've considered "vitrifying" the waste but the main problem there has been cracking of the once-solid vitrified materials, cause by gas molecules created by the decay of the radioactive isotopes. Transmutation, another proposed solution, has never been proven successful on a large-scale basis and most transmutation schemes require an additional nuclear reactor to produce the neutron flux needed to transmute the unstable fission products to ones with very short half-lives. And can it be done cleanly? And thoroughly? It's not even on the table as a research project at the NRC. What we can do with the used reactor cores is to let them be. Of course, that introduces a wide variety of other problems, all of which we now have: Finding locations, hardening the sites against potential terrorism threats, and hoping that nothing goes wrong due to metal fatigue, overheating, criticality events, airplanes crashing into the facility, earthquakes, tsunamis, and more. It's been said that the dry casks survived the earthquakes and tsunami at Fukushima, therefore we should be using more dry casks. It's true they survived, and they survived in North Anna recently when an earthquake moved them several inches on their beds, but none tipped over. However it's NOT true that dry casks can survive anything mother nature (and human nature) can throw at them! They could be in the wrong place at the wrong time, and that's why we need to limit how many of them there are. But the only way to do that is, of course, to shut down the reactors. That way, the fuel can be allowed to cool enough to move it from the spent fuel pools to the dry casks. If the reactors are operating, there will always be fuel in the pools and in the reactor. The "hot" fuel is extremely dangerous; the longer it is out of the reactor, the safer it becomes. In the first day the thermal output of spent fuel drops to less than half a percent of what it was when the fuel was in the reactor, and within a week it's half of that. But it has a long, long way to go before it is safe. And even if they do everything perfectly for the next 100,000 years -- a long shot bet, indeed -- they will not be a quarter of the way towards "solving" the problem of what to actually DO with the waste. Letting it sit is a recipe for letting something bad happen to it. The only reasonable and logical solution is to stop making more. But this "Waste Confidence" decision isn't based on reason or logic. It's based on keeping the reactors OPERATING for the next hundred years -- some reactors will be nearly 150 years old by then! But that's the plan: The NRC assumes that the storage casks will be properly manufactured and loaded. The NRC assumes that they will be properly guarded. The NRC assumes that Homeland Security will prevent all significant acts of terrorism against the facilities, and the security guards at the site with their pea-shooters will prevent the rest. The NRC assumes that the deadly fuel rods within the casks were not damaged during their 5 years in the reactor, or the 5 to 25 years in the spent fuel pool, or during transfer into the casks. The NRC further assumes that approximately three "interim storage facilities" will open across the country during the next century to "temporarily" hold the waste until a "permanent geologic repository" is established -- something just like Yucca Mountain, but feasible. The NRC assumes that transporting the fuel to these facilities will always be done safely -- well over 100,000 trips will be required around the country just for the existing fuel, with an average trip distance of close to 1000 miles (more if less than three interim facilities are established). 90% of the American population will be within 50 miles of a transportation route -- and 50 miles might still be too close, if something goes wrong during the transport of the fuel. The most insidious evil in this "Waste Confidence" process is that the NRC assumes that what they need to do is create regulations that allow the reactors to continue to operate. It does not occur to them what is obvious to so many others: There IS no solution to the waste problem, because ionizing radiation destroys any container you put it in. It escapes with tenacious capability and remains hazardous for many eons. It renders anything near it radioactive and poisonous as well. It kills in microscopic quantities. It maims and sickens whom it does not kill. And we have no safe place to store it. And there are clean alternatives for electricity generation. So why not just stop making more of this waste altogether? The NRC, most of all, should be able to see that that's the only solution to the waste confidence problem: Limit the size of the problem. If we stopped now, then at most we would need ONE interim storage facility where three were planned by the end of the century. If we stopped now, then in 88 years, in 2100, the youngest fuel would be 88 years old and far safer if an airplane hits it, if a terrorist launches a missile at it, or if it simply degrades and falls apart. Fresh, hot fuel is so dicey, and for what? To keep the fat cat shareholders who own the reactors rich? Certainly not to keep the lights on -- that could be more easily accomplished through safe, green alternatives! >I'm interest in heat. The maximum fuel temperature in a PWR reactor is about 650 degrees C ( 1,202 F). How hot is a fuel rod or fuel rod assembly when it goes into the cooling pool and when it comes out of the pool? How hot does it remain in the dry cask? Answers: Extremely hot, very hot, and just plain hot, hot , hot. Wikipedia says: "About 1 hour after shutdown, the decay heat will be about 1.5% of the previous core power. After a day, the decay heat falls to 0.4%, and after a week it will be 0.2%." The document linked to below has this sentence (on page 46): "In-reactor, the pellet temperature can be as high as 1,700°C at the center of the pellet, decreasing to about 400°C (the regulatory guidance limit) at its rim or outer boundary." On page 76 it says this about dry cask storage: "In general, cladding temperatures are expected to drop from about 400ºC to 100ºC over the first 10 years (assuming 30 GWd/MTU burnup, 5 year cooled fuel), with the temperature remaining at about 100ºC for the next 90 years." The residual radiation produces the heat, of course. The document also talks about all the many ways the fuel gets deformed in the reactor: Thermal stress, swelling from built-up fission products within, stress corrosion cracking, etc.. 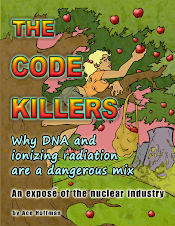 It mentions that the fuel rods are pressurized with helium when they are manufactured and then as they are used in the reactor, gaseous fission products increase the pressure even more, up to about 600 psi or more (page 49.) Later (page 59), it says that in the pool, "The internal rod pressure at room temperature is typically 3–7 MPa (440-1,000 psi)." I presume by "room temperature" they mean the temperature of the circulating water in the pool, which, they say, is about 40 degrees C (page 60). Poor water chemistry can cause additional fuel degradation. The temperature of the fuel cladding in the dry casks can be as high as 350 degrees C (page 61). The NRC has suggested limits of from 400 to 570 degrees C, but I guess they're not sure where to set the limit so they haven't. There are a lot of "unknowns" in dry cask storage, but there can be no doubt it's dangerous and we want as little of it as possible in SoCal!! This review finds that fuel rods discharged from nuclear power plants are typically in good condition with only a very small percentage of rods having cladding defects. Early references reported that less than 0.04 percent of fuel rods failed, and later plant records indicate that the failure rate has decreased to less than 0.0005 percent for more recently discharged fuel. During preparation for transfer to dry-storage facilities, failed fuel assemblies are loaded into specifically designed compartments of the canisters or metal casks, separate from intact fuel assemblies. The fuel-drying process is not perfect. After drying, residual water remains in unknown amounts that can affect subsequent internal degradation processes. The vacuum-drying heat cycles can change the nature of the hydrogen in the cladding and stress the fuel. According to the literature review, the fuel, the dry-storage system components (canister, cask, etc. ), and the concrete foundation pad may all degrade during dry storage. Some degradation mechanisms may be active during the early years of dry storage, while different mechanisms may be active at the lower temperatures that would be expected during extended storage. The most significant potential degradation mechanisms affecting the fuel cladding during extended storage are expected to be those related to hydriding, creep, and stress corrosion cracking. "Dry cask storage is the first step towards hardened on site storage, HOSS, which I believe is preferred by most experts." First of all, there is no room for HOSS at SanO. That's been affirmed many times by "experts." Second, there are many different versions of hardening dry casks. However, our dry casks have essentially NO hardening against airplane strikes or terrorists. Spent fuel pools are better protected against both, in part by being between the domes. 4 foot thick reinforced cement walls help, too. Third, there are essentially no "bunkers" for the dry casks. Actually, it's more like a TENT right now! Fourth, if it's a "step" towards HOSS, then it means additional transfer operations (plural), introducing additional expenses, complications, risks, and exposures. Fifth, again: If the reactors remain open, or even just in a state where they can be reopened when the political climate changes, then we aren't choosing between dry casks and spent fuel pools, we are choose both, with more and more dry casks forever. And sixth, there are no "experts" in nuclear waste storage. NOT ONE. There is no solution, only temporary holding places. Seriously: There are no experts in this field. There are no experts at Fukushima. It's a marvelous new science with lots of opportunities: The science of post-accident cleanup is a part of the science of nuclear waste management. It builds on sciences like metallurgy and thermodynamics and many others, such as robotics: all relatively new sciences themselves -- at least, in terms of the learning curve. But we do know that ionizing radiation can destroy any chemical bond known to man (by definition), so, nothing we build will last forever. 300 years is a pipe dream for dry cask storage, and less than 0.001% of the actually storage time needed. One dry cask contains millions of pellets of fuel. Each pellet contains "countless tens of thousands" of potentially fatal cancer doses which, in the case of the plutonium, can kill over and over with a 25,000 year half life. Dry casks are exactly what Southern California Edison needs to keep going, since Yucca Mountain is probably dead (and certainly should be). Dry casks are relatively cheap at about a million bucks each -- about 20 times cheaper than an additional spent fuel pool might be, if they could build one today -- and some people think they're effective. Ray Golden, former spokesperson for SanO and a highly skilled liar, claimed the dry casks would be effective under up to 50 feet of water. Of course, that assumes a tsunami they claim can't happen here. He never said what size airplane they could withstand, because the answer is: A piper cub, that's about it. They are also vulnerable to terrorism. Shut down is what we are about. We should not be distracted into supporting dry cask storage -- which, by the way, has been reported by whistleblowers to have welding problems right here at SanO, so they might not even be as good as the utility claims (ours are a unique design -- and remember how well that worked out for the SGs!). Other whistleblowers have reported other problems around the country (Google Oscar Shirani). Dry casks are not needed. A very deep, very many layers-lined spent fuel pool at ground level is a much, much safer alternative, especially if it is multiple pools so not too much fuel is in each one. Too expensive? Nobody said this would be cheap! A combination of both is something someone suggested to me many months ago. But truly, NONE OF THESE SOLUTIONS ARE ADEQUATE for the task, and that's the main point everyone should remember. And if restart occurs, then we have to restart the clock for 5 more years before all the fuel is cooled enough for dry casks. I wish some of you had been around when dry casks were first being planned here at San Onofre. Because back then, some activists supported it just as those same activists do today -- because they saw dry casks as the lesser of two evils, the main problem with the other evil being that the pools are too full, not that they are, in and of themselves and properly designed and loaded, more dangerous. Overcrowded pools, it has been argued, are more dangerous. But there is more than one way to not overcrowd the pools. Shutting down is a very good way. Dry casks aren't the lesser of two evils: They are just another evil, piled three high here at SanO. Even if you like the idea of hardened, dry storage -- for whatever reason -- what they are doing here at SanO with the crowded dry cask farm is an abomination.